This is the first post introducing one of my WIPs. Londemonium is the first English language novel I really started to work on. I wrote the bulk of the text during Nanowrimo 2013, it was my escape from my infernal office / call center job. Yep, you see it correctly it’s been in the works for 4 years now and it still hasn’t reached completion although it’s getting closer and closer to it. 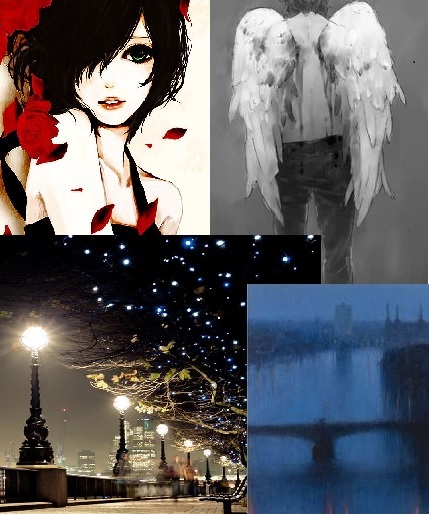 Londemonium is an urban fantasy novel, set in a world where Hell is a multicultural, global enterprise, sprawling in its own dimension like an infernal version of London. It’s narrated from four POVs, two are major, two are complimentary. 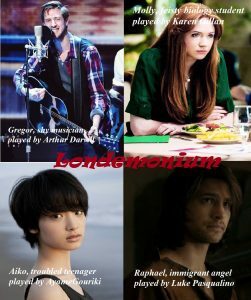 Gregor is a German computer programmer whose crush, Irene gets abducted by a young demon during their London trip. The ever calm and rational Gregor embarks on a fantastical journey to recover Irene from Hell. His story is a version of the Orpheus myth with a twist. Molly, the other main protagonist, is a feisty Irish biologist whose research partner gets spirited away. She also finds a passage to underworld just to discover her secret heritage as one of the descendants of the Sidhe, the Irish fairy folk. Aiko, is an English-Japanese girl who comes to live with her drunkard father because it’s still a better option than staying under the same roof as her mother’s new boyfriend. She sees visions of a mysterious woman in white. Raphael, is an immigrant angel. He arrived from Heaven and works hard as a police intern to get accepted. His task is to round up a dangerous journalist who threatens to expose the secrets of Hell. Londemonium is about how the lives of these four characters intermingle. Gregor and Molly end up in a flat share with Demi, the demon who got their friends. Aiko meets Rei, the majestic fox demon who helps her deal with her rage. The same Rei is Raphael’s superior who tries to help him get his naturalisation. Ideally, Londemonium is the first volume of a trilogy, revisiting the three otherworlds wellknown from Dante’s Divina Comedia: Hell, Purgatory and Paradise. Gregor Feuss Jr. hoped his upcoming London trip would change his life or at least its romantic department. On this star-crossed night, Gregor was strolling on the South Bank with Irene, the lady of his heart. In daylight, the Thames was like a muddy bandage across the heart of the city, but at night it turned into a mysterious dark force. Gregor heard it whispering secrets of conquered lovers and lost lives. Above their heads lamps blinked in Morse code to the stars and Gregor felt that the world was full of things beyond his understanding. You can find a Pinterest board with more aesthetics here. A full play of songs is waiting for your curious ears on Spotify. You can find excerpts from Londemonium here and here. You can read about me talking about Londemonium with the lovely hostess of Offbeat YA here. Here is a new song I’ve just discovered today, but it made me think of my novel baby immediately and it inspired this post, so I will post it here for your enjoyment. 2013? Hurry up with that book already! The lovely host wants to read it yesterday ;D (thank you BTW!). And should you ever need a beta or proof-read…just ask :). I’m a bit slow, but I work for free LOL.